There’s little doubt that the best trophy shots keep the fish in the water. Because I run a blog and Facebook page that often post “grip and grin” photos, I see a lot of negative comments about the way the person in a photograph is holding the fish. The two most common criticisms are that the person is squeezing the fish or holding the fish with dry hands. We don’t post any images that show a fish on the ground or an angler with his fingers in the fish’s gills or mouth, so I don’t see those kinds of negative comments, which I generally agree with. Conceptually, the idea is that dry hands dislodge the protective slime coating on the skin of trout and make it easier for infections to grow and penetrate the skin. Nonetheless, there is little scientific evidence that dry hands alone cause dislodgment of protective slime. It is clear that handling itself, regardless of how damp your hands are, is the major cause of stress for fish. I assume that even with this knowledge, most of us will continue to wet our hands before we handle a fish, out of habit and because the rationale behind the practice makes sense, but Doctor Grossman’s explanation makes criticizing someone else for dry hands less justifiable. There is a bit of hyperbole and of course no data offered to support his assertions. On the other hand, I do think that some fish die from grip and grins, but mainly because they usually require multiple “takes,” and the fish is often dropped on rocks a time or two. If you hold the fish too lightly, you are more likely to drop it. 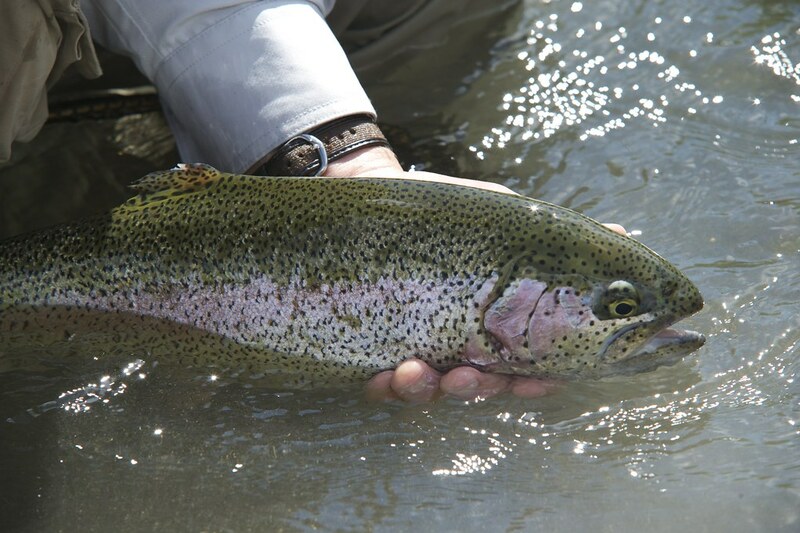 Putting a bit of pressure on a trout’s heart for a few seconds shouldn’t hurt it. The best thing to do, of course, is not take the fish out of the water, i.e., a net shot. My point in all of this is not that there aren’t right and wrong ways to hold a fish. We would never show a photo of a person with his or her fingers in a fish’s gills, for instance. But we need to remove some of the self-righteousness from the discussion because, frankly, there’s not a lot scientific evidence to support these arguments that are used to batter other anglers. If someone is holding a fish incorrectly in a photo, it’s most likely because they don’t know better. Yelling at someone or accusing them of murder is not the best teaching method. Great comments. Everyone wants to, or should want to, follow best practices to assure humane treatment and maximum suitability of the fish we catch, EVEN those of us who are not 100% against the concept of occasionally killing and eating a fish. And, even those we do kill and eat deserve the most humane treatment possible. The overly nit-picking criticizing however, without making it a friendly education opportunity as you suggest does, in my opinion, just lend to driving more people away from fishing (and hunting) making us more and more endangered species and also may well cause the very people we would like to educate better to just stop listening and be even less careful. Your comments were well written and I hope well received. Fishing is supposed to be enjoyable, friendly and helpful education is the way to go! It’s easy to cast stones, but I think we all have to accept that really the best thing for a trout would be to not try to catch it at all (barring the fact that the sport, and fly-fishing companies like Orvis, contributes greatly to conservation). Knowing that we are ALL doing more or less something not in the best interest of the fish, we would do well to tone down the righteous indignation. Some angry anglers come off sounding just like a PETA activist, but with more hypocrisy. You hit on the head: what’s needed is more education on best handling practices. Education isn’t well received when it’s comes in all-caps hyperbole. BTW, evidence may be lacking in fish handling mortality, but what I’ve read (ie. actual research articles) suggests that greatest threats are length of time spent fighting/out of water, and trauma to the head. So if drier hands help a novice get the shot and the fish back in the water faster and without dropping it once or twice on rocks or a boat deck, that’s probably a good trade-off until he can get the feel for a solid wet-handed wrist hold. I generally just try to limit their time out of the water. I do have a legit question for the more informed. In the fall and winter, I fish with fingerless wool gloves. Is it better for me to leave the gloves on and get the fish back in the water swimming as fast as possible, or should I take the time to remove the gloves before unhooking and photographing? I try to be as delicate as possible when I handle fish, but I also take quite a few grip and grin shots as well. That being said, fly anglers really need to step down off of the soap box more often. Being employed in the fly fishing industry in VT has exposed me to a lot of bickering, whining, and bitching about this or that angler, guide service, or angling practice. Can’t say I’m innocent of participating once and awhile either, but it’s exhausting, and most often the person complaining seems like more of jerk than the one they’re criticizing. We all need to lead by example, try and have a good time, and worry about more important things. Let’s all try and be more positive. Well written, Phil. In my experience, there are few communities that enjoy ‘know-it-all-ness’ and criticizing more than the fly fishing community. It is a real turn off to people who want to try the sport and find their way to certain online communities. The guys at S.C.O.F., This is Fly and Gink and Gasoline seem to keep this negative vibe out of it all and I would encourage anyone new to the sport or tired of these type of fishermen to check them out. “Based on the research conducted on these five widely divergent species, the Cooke Lab makes the following five general recommendations for conserving recreational fisheries through correct C&R. 1. Angling duration. The length of time a fish is ‘played’ increases physiological disturbances and recovery time due to depletion of energy stores and accumulation of lactate with other physiological imbalances. During recovery, the ability of fish to cope with stress, for example from air exposure or predator avoidance, is diminished. The Cooke Lab recommendation: Anglers should attempt to land fish as rapidly as possible to minimize the duration of exercise and the concomitant physiological disturbance. Anglers should chose optimal equipment matched to the size of fish that are expected to be encountered. Efforts to intentionally prolong the angling event through the use of light line or rods should be dissuaded. 2. Air exposure. During air exposure, gills collapse and the individual filaments adhere to one another, leading to the rapid decline of blood oxygen bound to hemoglobin and anoxia. Cardiac variables will require significantly more time to return to basal levels; the recovery correlates with duration of air exposure. Extended air exposure, for example during removal of barbed hooks, measuring and photography, can result in permanent tissue damage and eventually death; 38% of exhausted trout exposed to air for 30 seconds died, compared to 72% mortality following 60 seconds of exposure. Recommendation: Whenever possible, anglers should attempt to eliminate air exposure by handling fish that are to be released in the water. When fish must be exposed to air, we urge that anglers do everything possible to minimize the air exposure duration due to the overwhelming negative consequences associated with that action. 3. Water temperature. Fish taken at high water temperatures, an environmental variable that differs in impact among different species, suffer increased physiological stress, greater oxygen debt, and increased mortality rates. In addition, the quantity of dissolved oxygen in water decreases with increasing water temperatures. Recommendation: When water temperatures are their highest, both the duration of the fight and handling time should be minimized. Ideally, fishing should be restricted during extreme water temperatures. For Atlantic salmon in eastern Canada, Atlantic salmon rivers are temporarily closed to recreational angling during excessive water temperatures. Extreme water temperatures are undoubtedly one of the periods where fish are particularly susceptible to mortality. 4. Bait type, terminal tackle, and hooking injury. An obvious determinant of potential injury and mortality is the use of barbed hooks. Studies of barbless hooks found that they allow a more efficient release of the fish and produce less tissue damage, thus resulting in less mortality. In addition, artificial lures and flies tend to hook fish in the mouth, compared with live or organic bait which is more often ingested deeply and thus closer to vital organs, making hook removal more difficult and harmful. Recommendation: Barbless hooks should be widely adopted by anglers. Anglers using barbless hooks and reducing the emphasis on the use of organic baits will generally lead to minimal injuries, reduced handling time, and lowered chance of mortality. 5. Angling and the reproductive period. The benefits of minimizing stress during reproductive activity are obvious – increased offspring to contribute to subsequent year classes. Studies of largemouth bass found that removal of males from the nest quickly resulted in predation of the unprotected offspring. Even after returning to the nest, males exhibited impaired swimming behavior for the next 24 hours, and provided less care to surviving offspring. Studies also suggest that largemouth bass caught immediately prior to the spawning period in a simulated bass tournament format produced fewer and smaller offspring. If you can’t get the pic in under 15 seconds then you don’t deserve the pic. If you’re gonna parade around for 30 seconds and take glamour shots then kill the damn thing and eat it. I can’t stand the “look at me” mentality that pervades this sport nowadays at the expense of the fish. I absolutely agree with this statement! Great comments, Phil. One item that many people overlook is the orientation of the fish when the photo is taken. Holding a fish vertically can do significant damage to a fish. This is most common with bass as we tend to grab them by the lip and often don’t support the belly. This can put undue stress on the jaw and could dislocate it. It can even lead to damaging other internal organs as the weight is distributed. Always remember to support the belly of a fish you lip! Thank you for posting this. When I first saw the pic of my last fish that I was holding out of water, I was mortified at the thought that I was harming and lessening its changes for survval. This provides some relief to the stress of that thought , that bothered me to this day. I still believe that taking a pic of a netted fish, while in the water, is still the best practice overall. I personally never touch the fish if possible… I like to net em and leave em in the water and take the hook out with forceps all while never touching the beautiful creatures. I think it was Twain that said “A man with a full stringer of fish never goes home by way of the back alley”. That aside, I’ve found that there are always those, in every community, who seem to feel the need to belittle others in some way shape or form, it’s unfortunate, but true. I try to remember to wet my hands, but in the excitement of the moment sometimes forget to. I do try to limit the amount of time the fight is on, and how long the fish is out of the water though. In fact, I have yet to photograph any of the fish I’ve caught because I’m so intent on getting them back into the water as quickly as possible, except of course the one’s that I take home to eat. there is a right way to hold the fish — if you’re C&R — dont hold it. pretty simple. if you need a picture of every fish for your facebook or instagram page may I suggest you take up lawn bowling or something else where God’s creatures don’t have to act as props for your ego. We need to remember that Angling is a “kill sport”, even if we are practicing the very best “catch and release”. All the past data suggests that even with barbless hooks and the best C&R practices, there is still the possibility for mortality at a low base percentage. Considering that on my most recent outing with a friend, many of his friends on social media were shocked to learn that we weren’t KEEPING and EATING everything (or anything) we caught, it’s safe to say that the practice of “fishing” is still very much seen as a “catch and kill” sport by those who don’t particpate, even thought much / most of the time, it seems that Fly Fishing has really walked away from those origins. Watching the insanity with which a steelhead or salmon will run itself ragged on the rocks and gravel and manages to survive, I’m far less concerned than most staunch C&R proponents. A fish photographed on the bank and released still has a far better chance at surviving than the one thrown in the creel. I might argue that resting in wet grass for 10 seconds while a good shot is snapped is far better than being dropped from 3 feet above during a “lifted” shot. Everyone has their own personal ethic but at the end of the day, we ALL are going to cause a fish here and there to die no matter what we do. There’s a fine line between sharing an opinion or an insight, vs. trying to shove your particular branch of C&R religion down the throat of a fellow angler. Practice kindness and tolerance and realize that preaching “absolutes” ensures that sooner or later, you’re going to be wrong in what you preach. Excellent post on an important topic. Reading the comments brings to mind an old saying from who-knows-where: “There are three sides to every story. Your side. My side. And, the cold hard truth.” Think it over and, you decide where you personally stand in all of this. I believe if one is really worried about the accidental death of a fish caught then they should just put down the rod for good. Its fishing every fish you hook has a chance of not surviving after release. Nothing I can’t stand more is a bunch of fairy wand flipping snobs who thinks they are superior in there ways, them dry only guys are always the worst. Good day. These are some thoughts that we have on the subject and are posted on our web site. The number one reason for fish kills is overplaying. During a prolonged fight, a fish builds up lactic acid in its system. Too much exertion and the lactic acid will prove fatal even though the fish might swim away after being released. Secondly, fish have evolved in an environment that is akin to being in outer space. Gravity is not an issue so they have developed skeletal frames that are minimal but more than enough to support their internal organs. Once out of the water they are subjected to the same gravitational forces as ourselves but without the body structure to deal with it. And the bigger the fish, the more the problem. Thirdly, fish can breathe only in water. When they are out of the water they are going to go bezerk, gulping for air. If they are in a net when that happens, that’s when fins and jaws can break. Holding a fish out of water is like water boarding for us. The best way to make sure that your fish survives is to never let it leave its home environment- the water. Think of a landing net as a corral. You can land your fish quickly, reducing lactic acid build-up, and your quarry will remain calm as long as it is in the water. You can easily remove the fly (which has a barbless hook) and give the fish time to recover. You will also have ample time to take as many photos as you want. The meaning of the old simile “like a fish out of water” should be taken literally by us. One finding that I have never read about is the “eye set” of a trout in a photo. As you catch fish in the next year check out the eyes. Also check old photos you may have. I think you will find that the eye position is good at predicting distress in fish. Check out the direction the eye (pupil) is looking in Phil’s article. It is looking DOWN. This is where a trout or salmon should be looking when it is out of the water. When a fish is in severe distress or dead, the pupil becomes centered in the eye. Eye set does not depend on the fish being held up. Even when the fish is flat on it’s side, the eye looks down. So go to your fish photos and check out their eyes. If you don’t believe me, google “trout photos” in google images and take a look of photos of fish being held out of the water to be released and compare them with the photos of fish that have been harvested.